In the November 1999 issue of EPE (Everyday Practical Electronics), a small and intriguing circuit was published in the Ingenuity Unlimited section by Z. Kaparnik. 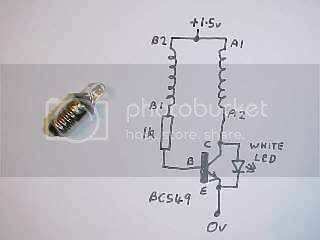 It was a very small implementation of a typical transformer feedback single transistor invertor. 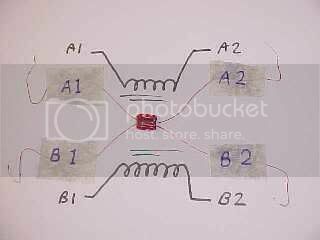 The transformer was a standard ferrite bead with two windings wound on it and the circuit was using the high voltage pulse generated when the transistor turns off to light an LED from a single 1.5V battery. 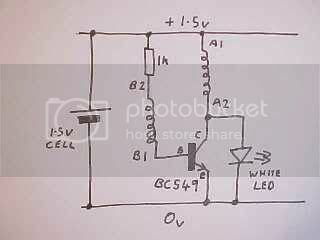 This page has two variations on the original design to use the simple circuit in a useful manner. I originally called this torch the vampire torch because it sucked the last remnants of life from a cell, but then decided to call it a Joule Thief instead because it was a catchy name and played on the fact the unit steals the last bit of energy from a cell. (Joule is a unit of energy) I guess the name has kinda stuck! 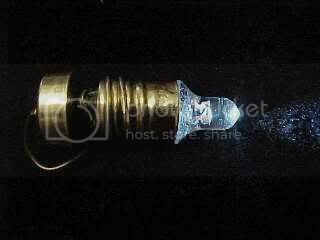 Here's the Joule thief. It's like an open PCB torch that will take either an AA or AAA battery in the holder and use whatever power is left in the battery to light a white LED. The amazing thing about this circuit is that it will run right down to about 0.35V if left running continuously, and will often provide a week of continuous low level light from a battery that would normally be considered dead. The level of light is initially quite high but gradually reduces as the battery voltage goes lower. However, it can still be used for reading in a dark room, even when the battery is almost completely drained. 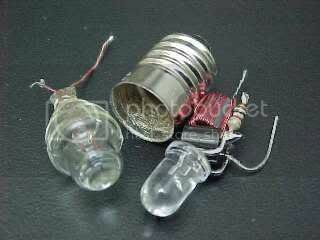 These are the components used in the circuit, and as you can see there are very few. One metre from the spool of enamelled wire will be used to turn the ferrite bead into a transformer, the resistor will be used to limit the feedback current to the transistor, the transistor will switch on and off about 50,000 times a second and the white LED will light. 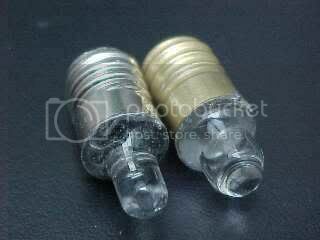 The ferrite bead is a plain type usually sold in packs of ten or fifty. 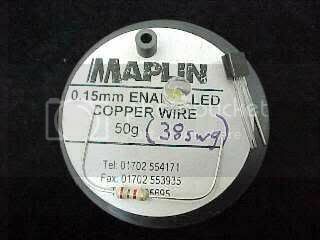 The one shown was sourced from Maplin Electronics in the UK although just about everyone does them. Don't use anything other than plain cheap vanilla ferrite, since any other type will reduce efficiency. Take a metre of the 38swg (0.15mm) enamelled wire and fold it in half making sure that the point of the fold is nice and sharp since it will be used to thread the wire round the ferrite bead. It is important to lay the wire on evenly and pull it firmly round the form since you will need to make twenty turns of the doubled wire and it's a tight fit. Don't worry if you make a mess of it, since the ferrite bead can be re-used and you will have lots of spare wire to practice with. The whole process of winding the bead is the most tricky part of the project and is made slightly more awkward by the fact you are winding two coils on simultaneously. When you pull the loop of wire through the bead be sure to carefully guide the loop through so that it doesn't twist as shown above. It's the single most likely thing to mess up your transformer, so go slowly and carefully. When the bead is wound you should have a pair of wires sticking out each end. Crop them to about 2" (50mm) and tin the ends, then meter them to find which wires are part of the same winding and label them as above. Here's the actual circuit (minus the switch). Building it is easy although care should be taken soldering the ferrite beads wires on the PCB. The PCB layout in the TIF file below has the windings clearly marked, and when inserting the bead be careful not to mix the wires up. The act of soldering the leads should melt the laquer off the wire, but examine the joints carefully afterwards to make sure that the solder has taken to the wire. If you want to make one of these devices then you will find the PCB layout and foil below in TIF format. If you view the images directly they will look a bit ragged at the edges. This is because they have been scanned from a laser printed original, but when they are printed at 600DPI the image will be fine. I chose TIF because it seems to carry information that results in printing being done at the correct size. If you don't have the ability to read the TIF format on your computer then you might take a look at the Irfanview website where you can download a freeware file viewing utility. Here's another variant on the circuit which has been optimised for fudging together without a PCB to allow it to be inserted into an MES torch lamp base. I mean it's REALLY small! 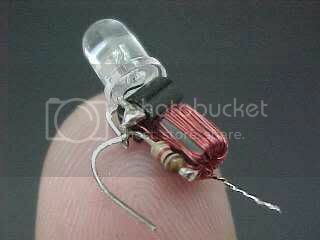 I used an 1/8th watt resistor for size reasons. A standard lamp is gutted out by desoldering the end contact and gently squeezing the lamp in a vice to loosen the cement that holds the glass bulb in. You can see that the excess cement has been scraped away to make room for the little electronic module. The module is sleeved, connected and then resined into position.